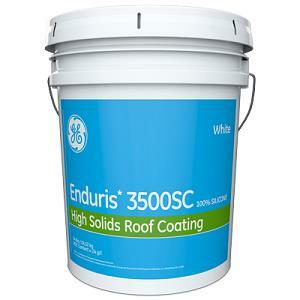 GE Enduris 3500 silicone roof coating is a high performing protective barrier for a variety of architectural surfaces and roofing substrates. Upon cure, Enduris 3500 silicone roof coating forms a durable, breathable and weatherproof roofing membrane. Prevent leaks. Extend roof life. Reduce maintenance costs. Protect and extend roof life with Enduris 3500 silicone, high-solids, primerless roof coating. For new construction and restoration projects alike, Enduris 3500 coating can perform in even the most demanding environments, on a wide variety of roofing substrates. A single coat of Enduris 3500 coating cures quickly to form an exceptionally durable membrane that is breathable, waterproof, and permanently flexible. It is UV-stable and maintains its elasticity even after decades of exposure to weather and climate. Enduris 3500 coating securely bonds to many roof substrates including single-ply, modified bitumen, BUR, SPF, metal, or parapet walls, and existing coatings.